Rizin Fighting Federation returns on Sunday with their ninth event. The card features, among other things, three more first round bouts for the 2017 Rizin Bantamweight Grand Prix as well as a “wild card qualification bout.” There were three bouts on the April show with #41FW Kyoji Horiguchi, #83BW Khalid Taha and #74BW Takafumi Otsuka advancing to the second round. 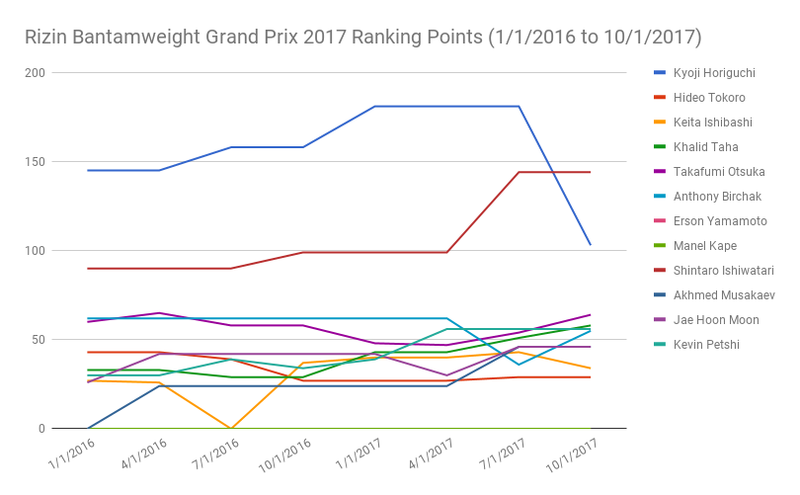 The follow chart shows the ranking points for all tournament competitors over the last two years. As you can see the two standouts from a rankings perspective are Horiguchi and #18BW Shintaro Ishiwatari. Horiguchi’s ranking dipped recently due mostly to inactivity, but he is still the odds on favorite to take the tournament. Ishiwatari is currently riding a four-fight winning streak with wins over Ostuka, #55BW Victor Henry, #258 FW Jonathan Brookins and #35BW Rafael Silva. The reigning bantamweight King of Pancrase also has the highest Rankings Momentum of all the competitors at +8.04.